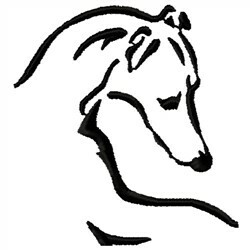 This is a stunning outline design of a whippet. Sew this onto a tie or scarf for owners or breeders of these beautiful animals! Embroidery Stitches is happy to present Whippet Logo machine embroidery design which has 2154 stitches and is [54.61 mm x 58.42 mm] large. If you would like to view more embroidery patterns please search on our embroidery designs page.